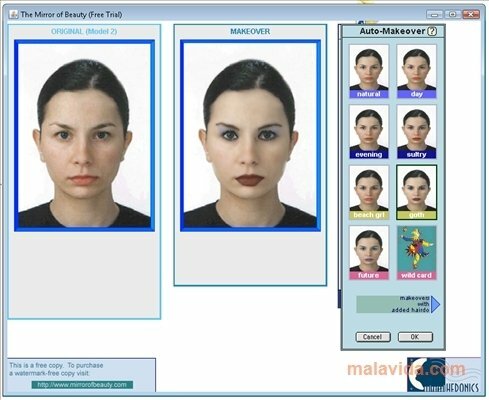 The Mirror of Beauty is a program developed to be able to find out what a change of look, whether new makeup or a new hairdo would look like on you. By means of an interface that is similar to that of an image editor you will be able to apply all kinds of changes over various sample images or photographs that you have stored on your hard drive. 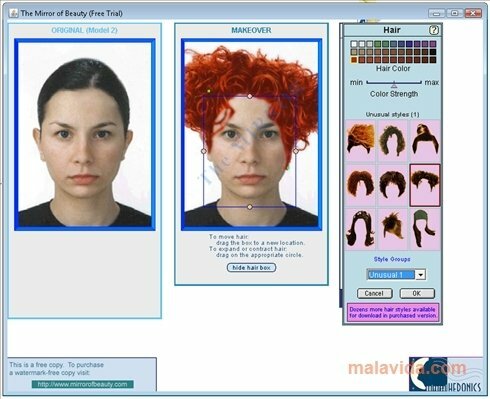 This tool offers you the possibility to apply several kinds of makeup (eye shadow, lipstick,...), choose different hairdos (with the possibility to choose the style and the color), simulate an increase in the size of your lips, apply age changes that recreate what Botox could do for you or make any image more feminine. Furthermore, the application has an auto makeup system, that will provide you with the possibility to choose between several combinations. The program is ideal for beauty salons in which they want to show several options to any customer, before they choose a change of look. Download The Mirror of Beauty and discover how simple it can be to see yourself with a totally different look. This application requires that you have Java installed to work. The trial version inserts watermarks in the modified files, it doesn't allow you to save any project and some of the tools have restrictions.